In just a few weeks the winter solstice will be upon us, marking the darkest day - solarly speaking - of the year. Fitting that many choose to light up these long nights with twinkle lights, cozy fires and bright candles. These creature comforts help make these dim days a bit brighter and a whole lot more tolerable. Let's not forget we each possess our own personal light and energy. This amazing inner light source can be cultivated at will (truly the original, renewable energy source) and shared with others, too! So, tap into your brilliant light and please share it with others often and freely during these weeks when we all desperately need a luminous lift. 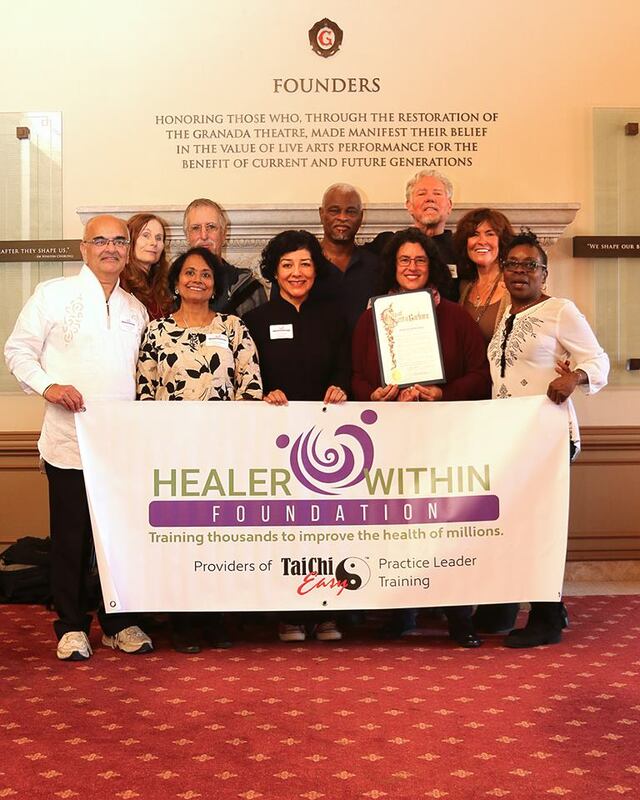 At the Healer Within Foundation, we continue to be touched by the powerful energy of our volunteers, trainees, trainers and donors. As always, we'll share some of these stories with you below. We've also got a few programs and products to offer you which we hope will help lift your spirit.Thank you for taking time to check in and see what we are up to. From us to you, be well and shine on! Our Community Practice Celebration took place at the historic Granada Theater in downtown Santa Barbara on November 15. The event was attended by over 100 Tai Chi Easy™ and Qigong enthusiasts. Those in attendance included members of the Santa Barbara practice group, several HWF Board members, special guests and a large contingent of students from the IIQTC Level 2 training which also took place that week. The celebration honored the 35 year history of the Community Practice Group in Santa Barbara and the nearly 25 years of volunteer leadership by Dennis Furuike. 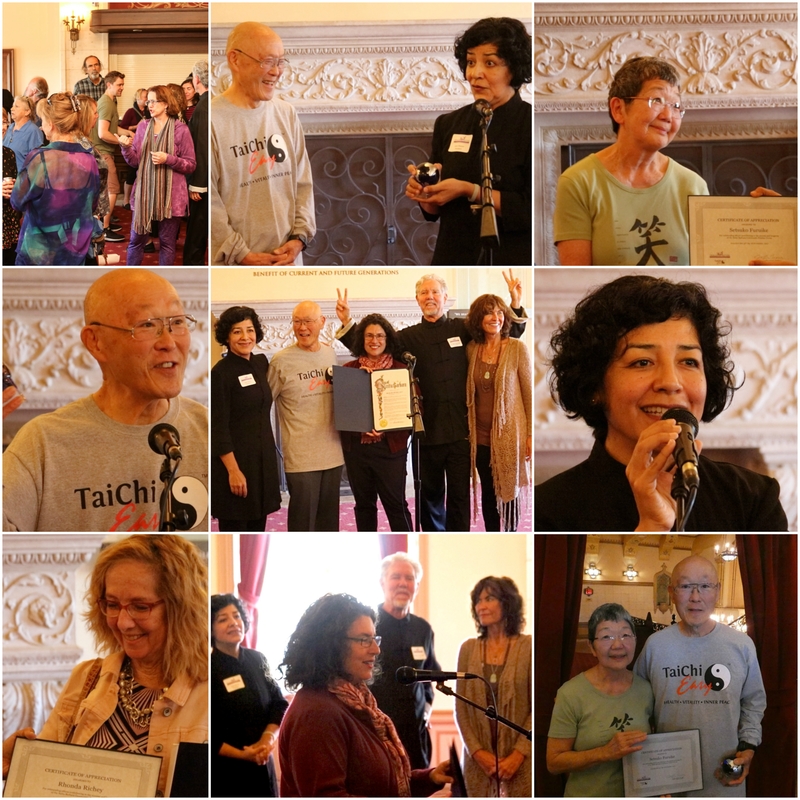 Special recognition was also given to Setsuko Furuike and Rhonda Richey for their volunteer efforts contributing to the longevity and success of the group. See more photos of the event at our Flickr page. See the beautiful proclamation presented by the City of Santa Barbara HERE. A video of celebration highlights is in the works. Stay tuned! Join the Community Practice Group Challenge TODAY! The Bartlett Family Foundation has generously given $5,000 to match gifts donated to the Healer Within Foundation through Dec 31, 2017. 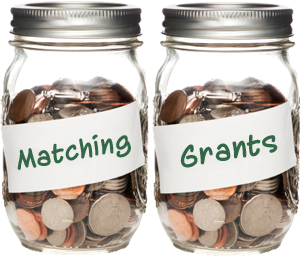 If you are giving to the foundation for the first time, coming back as a donor, or increasing your annual gift, your donation will be matched dollar-for-dollar! Our goal is to assist Practice Leaders in forming community practice groups and in joining the HWF Leadership Circle. Monies will be used to grow our national - and international - network of Community Practice Groups. These community groups bring to life our vision of a world of self-healing, wellness and vitality! Please click HERE to donate in support of the Healer Within Foundation mission and sustainability. Thank you! Our next 5th Saturday, Gathering in the Cloud meeting will take place on December 30th beginning at Noon PST/3:00 pm EST. 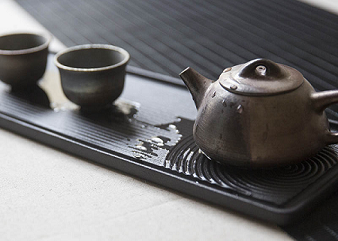 The topic for this very special gathering is Qi and Tea Ceremony: Health and Healing Stories. Guests will include HWF Board Member Emeritus, Daniel (Dan) Weicher who brings his own compelling story of healing to our gathering. Follow Dan at his website, Recovering The Way. If you have not already done so, please SIGN UP to attend the virtual gathering. Meetings take place on Zoom (similar to Skype) via phone or internet access. Please note, you will need to sign in to the new website to access the sign up form. Instructions for how to sign in appear at the bottom of this email. Later this month, we will email instructions to participants for joining the meeting and also how you might wish to prepare for the tea ceremony. It is sure to be a special time of sharing and a wonderful way to prepare for the new year. We hope you can attend! at right). Erin has been a consistent contributor to HWF and her generosity this year with a $10,000 donation is amazing! The mission and vision of HWF would be impossible to achieve without the monetary gifts from Erin, and others like her, who choose to support our goal of training thousands to improve the health of millions. How did you first become involved with Healer Within Foundation? I first heard about the Healer Within Foundation at a Circle of Life training at Omega in 2007 with Roger Jahnke and his wife Rebecca. One of the assistants suggested to the group we might want to consider making a donation to the Healer Within Foundation. During the training, we learned some of the practices from the book, The Healer Within from Roger [Jahnke, OMD]. I liked the practices, but once I was back home, I forgot all about making a donation to HWF. In 2009 I went to a Tai Chi Easy™ practice leader training. During the second day while sitting in a lecture, I noticed I felt so good I wanted to get up and run around the block and I hate to run! I knew there was something powerful about the practices we were learning. I started sharing Tai Chi Easy™ with others soon after the training. I discovered that making Tai Chi Easy™ a regular part of my life helped me feel better than I had in years. The following year when I received a letter asking for a donation, I sent a check. The interest in the Healer Within Foundation is growing. Why do you feel that is? There is growing interest in learning how to enhance personal health in a natural way. The Tai Chi Easy™ Dissemination Project of the HWF is bringing simple, time-tested health enhancement practices to people in communities around the world. What do you wish others knew about the Foundation? That the trainings the HWF supports are having a positive impact on the world. People are learning how to help themselves be healthier, more happy, and less stressed. 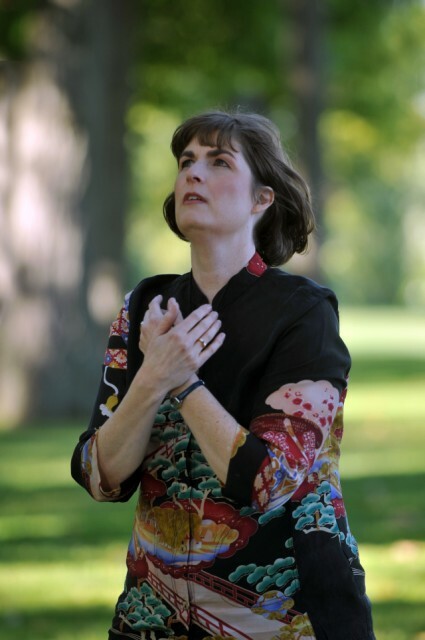 I lead a community practice group and love hearing from the participants how Tai Chi Easy™ has improved their life. I had a heart attack when I was 40 (over 10 years ago now). I came to the Tai Chi Easy™ Practice Leader training to learn how to manage my stress better. The practices I have learned through trainings with Roger Jahnke have been life changing for me. I am no longer bothered by angina. I have no current cardiac issues. Recent blood work showed the marker for inflammation at a low cardiac risk level. 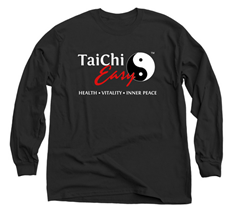 I credit Tai Chi Easy™ for my good health. The Healer Within Foundation is a 501(c)(3) organization. Contributions are tax deductible to the extent allowed by law. 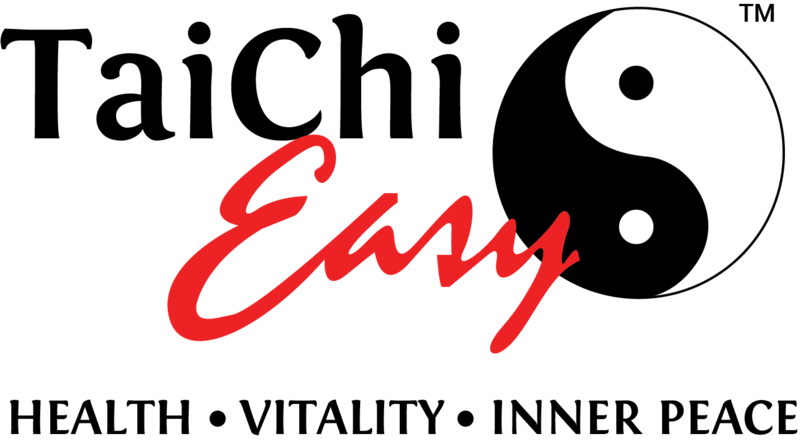 We are delighted to report there are already 7 Tai Chi Easy™ Practice Leader trainings scheduled, with two more currently in the approval process! Click HERE for a full list of future TCEPL training dates and check back often as new training opportunities are being added regularly. Interested in putting together a Tai Chi Easy™ Practice Leader Training event in your area? Contact Christie Ward or Toni Horn for more information. T-Shirts Now Available in BLACK! Order by December 6 for Holiday Delivery! We have had several people request we offer black apparel and the folks at Bonfire were kind enough to re-work our art to allow this to happen. So, place your orders NOW for delivery prior to December 25. We will launch a new campaign after the 6th, but wanted to offer a last-minute opportunity for holiday shoppers! There are a few styles to choose from (hoodies, too!) and all shirts are available in gray, white and now BLACK! Shirts can also be shipped to international destinations. Shipping costs vary based on your location, but you can help us start the self-healing conversation no matter where you are. For White and Gray apparel, click HERE. For Black merchandise, click HERE. We'd like to invite you to explore the new Healer Within Foundation website! So pardon our dust, we’re still under construction. But we invite you to come see what we’ve started. To login, you will first need to set up your password. Click here to update your Password. Once updated, you can login here, using your Username - usually your email address - and new Password. While you are logged in, please complete your profile (it is searchable to help other HWF community members find you)! Logging in allows you to make a donation securely, see our community member-only content and to sign up for events such as the Gathering in the Cloud meeting coming up on December 30th!